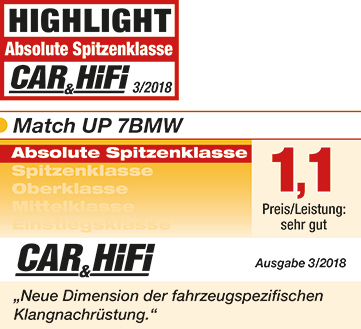 The "M package" for your BMW HiFi sound system (option 676) – The MATCH UP 7BMW is a revolutionary sound upgrade for those who desire significantly more power and dynamics, but also care about seamless integration into the vehicle. The installation is done in the blink of an eye at the mounting position of the original amplifier thanks to the included Plug & Play connection cable and a custom-fit mounting plate. Nevertheless, the UP 7BMW amplifier is so flexible that it can easily be used for universal applications in BMW vehicles. Besides Audiotec Fischer's proprietary Class HD technology and the cutting-edge 64 Bit DSP with tremendous processing power, new and high innovative DSP features such as "Augmented Bass Processing", the "StageXpander" and the “RealCenter” function guarantee top-class listening pleasure. Of course, the UP 7BMW also offers a MATCH Extension Card slot (MEC slot) for additional input and output modules such as a Bluetooth® Audio Streaming module or a High Resolution audio USB sound card. Thanks to the professional and user-friendly DSP PC-Tool software V4 the configuration of the UP 7BMW becomes straigthforward and intuitive. MATCH Extension Card slot (MEC) for additional input / output modules like Bluetooth® Audio Streaming, High Resolution Audio Streaming via USB etc. The UP 7BMW combines the advantages of a Class H technology with the principle of a class D amplifier. The result is an unsurpassed efficiency which easily outperforms any conventional Class D amplifier. By varying the internal supply voltage depending on the amplifier’s amplitude of the input signals, idle losses are significantly reduced and overall efficiency is close to maximum at any time. Modern, factory-installed car radios incorporate sophisticated possibilities of diagnosing the connected speakers. In particular the latest generation of BMW car radios are equipped with additional monitoring functions so that failure messages and loss of specific features (e.g. fader function) quite often appear if a common amplifier will be hooked up - but not with the UP 7BMW. The new ADEP.3 circuit (Advanced Diagnostics Error Protection, 3rd Generation) avoids all these problems without loading the speaker outputs of the OE radio during high volumes unnecessarily. The switched power supply of the MATCH UP 7BMW assures a constant internal supply voltage even if the battery’s voltage drops to 6 Volts during engine crank. If the supply voltage drops below 10.5 Volts for more than five seconds the amplifier goes to “Protect mode” (Status LED lights up red) in order to avoid any further discharge of the car’s battery. Switching from analog input to the digital input is done automatically as soon as a signal is detected on the Optical Input. This feature can be deactivated in the DSP PC-Tool software. Alternatively you can use an optional remote control for manual switching between analog and digital inputs. The Power Save Mode is incorporated in the basic setup. It allows to significantly reduce the power consumption of the UP 7BMW and potentially connected amplifiers once there’s no input signal present for more than 60 seconds. Please note that in many up-to-date cars with “CAN” or any other internal bus structures it may happen that the radio remains “invisibly” turned on for up to 45 min. even after locking and leaving the car! Once the “Power Save Mode“ is active the remote output and therefore the connected amplifiers will be turned off. The MATCH UP 7BMW will reactivate the remote output within a second if a music signal is applied. It is possible to either modify the turn-off time of 60 sec. or completely deactivate the “Power Save Mode” via the DSP PC-Tool software. The “RealCenter” feature is an algorithm, developed by Audiotec Fischer, that emphasizes the music information which is present in both the left and right front channel to create an unique center signal. In contrast to common procedures, in which only the channels are summed up, the intensity of the center signal is also dynamically controlled by the stereophonic informational content of the left and right channel. Sounds complicated but this effect is astonishing: That means if solely the left or right channel delivers an audio signal, the center channel will not reproduce a signal. In the case of common algorithms, the volume level of the center channel is only reduced by 6 dB (= half volume level). Audiotec Fischer’s “RealCenter” allows a unique, broadened sound staging for both driver and co-driver at the same time! Therefore, the disadvantages of a conventional center channel, such as an intrusive, small sound stage, are things of the past. Audiotec Fischer‘s proprietary “Augmented Bass Processing”, consisting of the two revolutionary sound features “Dynamic Bass Enhancement” and “SubXpander”, has been especially developed to dramatically improve the bass reproduction of OE subwoofers. The “Dynamic Bass Enhancement” ensures that the under-seat subwoofers of the BMW always play in their optimum conditions – regardless of the music style or the factory tone controls in the head unit. Depending on the input signal, the “Dynamic Bass Enhancement” gains the lower frequency range and varies the cut-off frequency of the subsonic filter. The clou – the parameters of the algorithm are precisely adapted to the installed loudspeakers. The result is a significantly more powerful and deeper bass response at low and medium volume levels without the risk of overloading the subwoofers neither mechanically nor electrically at high volume levels. This despite the considerably higher power output at the amplifiers subwoofer outputs compared to the original system. It is simply fascinating which bass performance is suddenly possible with the original speaker systems. If you want an even lower and “darker“ bass reproduction, the “SubXpander“ can be additionally activated. Therefore, subharmonic tones are added to the fundamental tones in the frequency range between 50 and 100 Hz. Depending on the speaker arrangement in the vehicle, a more or less wide stereo sound stage can be created on the front seats. A center speaker may limit the spatial reproduction of the music additionally. This is where Audiotec Fischer‘s new "StageXpander" comes into play – a sound feature which seems to break the acoustic limitations and thus allows to create a way broader stereo base without negatively affecting the precision of the localization of voices or instruments! The effect can be adjusted according to your personal preferences in four steps. You are looking for more transparency and substance in the treble reproduction? With the “ClarityXpander” Audiotec Fischer is now offering the right tool. Properly adjusted (and therefore selectable in three steps) the feature adds additional harmonics in the upper frequency range – this is especially useful if the original speakers lack some brilliance in the treble response. The extra treble-kick is not only available for the two front channels but also separately adjustable for the center channel. Even better – the center channel allows to activate an automatic and dynamic control so that music with “loads” of treble doesn’t fatigue your hearing. 1.81 x 5.12 x 6.02"